I am bored with windfarms. Tidal energy? Wave power? The Orcadians have stolen a march, or a tidal race, on Shetland even though our tides and waves are of course far, far better and racier than those belonging to the inorganic beef farmers of the southern isles. Who needs salt water? For the last few weeks I have been consumed with thoughts of a far more immediate, less engineering-heavy source of energy. I speak, of course, of peat. As I write, I have just returned from the first of what will probably be nine visits to the hill, there to load the already raised and mostly dry peat onto the trailer of my Goldoni two-wheeled tractor (Mediterranean Merry Tiller, known as Lascivia and an evil, vicious machine from hell. Or to be precise, Italy). Our peat banks are a tortuous and boggy 100 metres or so from the nearest passing place, and easier access has been denied us by the SIC’s Ditch Department, back in the days (two years ago) when it was intent on digging enormous trenches beside every Shetland road and eradicating all forms of wild flower infestation. Fortunately, the council no longer has a ditch department. It has been ditched, so that the money saved can be ploughed into the maintenance of consultative iPad trials and the insertion of communications devices into the skulls of councillors. Putting a flea in The Flea’s ear, I believe this has been called. 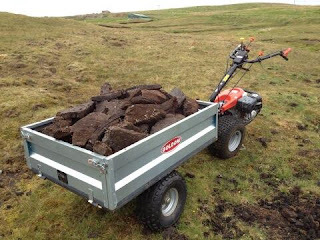 Anyway, what I have to do is put the tiller/trailer on a road trailer, tow it to the peat bank, unload it, trundle my way to the raised peats, fill it, wrestle my way back to the passing place, transfer the peats, and repeat six times in all until the big trailer is full. That’s about two and a half hours of work. Back to the house and, peat by peat, stack the brown horrors. Now, I know that something is missing from this scenario. And that something is bags. Plastic fertiliser or sheep or salmon feed bags, the classic method of transferring peats home. I hate them with a great hatred. I hate the way the grow brittle and break, but only once you’ve filled and are lifting them. I hate the way they fill with water, re-soggifying the dried peats. I hate the fact that they add several more processes to the already ludicrously human-heavy business of using peat as a domestic fuel (pleading with somebody for bags, fetching them,taking them to the hill, unfolding and filling them, lifting the full bags onto a barrow, barrowing them to the road, stacking the bags, lifting them onto a trailer, lifting them off a trailer, emptying them). Admittedly we have a neighbour who has offered to quad-bike-and-trailer our peats to the road but that still involves hand-bagging. As opposed to handbagging which is totally inefficient. The leather just won’t take the strain. Two years ago, I crazily bought several hundred net sacks designed to carry logs; These proved even more susceptible to light than plastic feed bags. They had the tensile strength of toilet roll after a few days on the hill. I wept peaty tears of rage as they failed time and time again. Scraps of these horrendous items still blow up and down Ronas Voe, and may even have been swallowed by salmon and incorrectly identified as parasitic orange worm infestations. Anyway. Six wee Goldoni trailerfuls of peat make one big road-trailerful. I estimate nine more Ifor-Williamsfuls to get the rest of the peat home. I am treating it as a penance. I am contemplating ponies and kishies. And of course, while engaged in this work, I have been thinking. And the future of Shetland is of course, not wind, not wave, not tidal, not the ridiculous notion of imported wood. It is peat. Back in the 1970s, just pre-oil, it was suggested that Yell, 55 square miles of which is covered in peat to a depth of at least five feet in old money, could become the site for a peat-fired power station. This was in the end rejected in the face of black gold’s arrival. Now, peat power stations are nothing new, though it is generally argued these days that burning peat is a heinous environmental sin, second only to eating dolphin-poodle stew, as is common in Faroe, where the ceremony of the mass poodle slaughter is a much loved annual event. And dolphin farming is common. But Estonia has a modern peat-and-biomass fired power station, so does Finland, and there is a sneaky way in Scandinavia of planting your used peat bogs with Reed Canary Grass which can be harvested, turned into briquettes and used as fuel, or processed to produce the psychedelic drug dimethyltryptamine, which is like LSD and makes you feel like you’re inhabiting an alien planet. Some would say that’s entirely unnecessary in Yell, but who am I to comment? You must admit, this is a much more interesting prospect than awful oil, tedious tidal or woeful, bird-chopping windfarms. Hallucinogenic electricity, made from peat and plants! The aroma of peat reek, wafting across Yell Sound! And just think of the spin-off industries, like tushkar manufacture, kishie-making and pony breeding. Because obviously Goldoni two-wheeled tractors wouldn’t be appropriate. Besides. They’re rubbish, and I hate them. Want to buy one?